While being an idle clicker, Tap Hero is also a strategy game. Albeit, not a very good one. The premise is simple, tapping on the screen will change the direction the knight is facing and he will attack once. Enemies will come from both sides and it is up to the player to time the attacks back and forth. At the top of the screen is a bar that fills with every kill. Once full, the knight will unleash a powerful attack that clears the screen. Every so often, killing an enemy will reward a coin. Save enough coins to buy new armor and weapons. Complete the set of armor to gain an extra life. It's simple, easy to play in your downtime, and offers a carrot on a stick to keep players going. Now, because it is a free title, there are ample opportunities for ads. Every so often, upon death, players will have the option to watch an ad that will reward them with coins and allow them to continue their rampage. If one doesn't want to do that, there is an option to buy the full set of armor for $3.99. But, once you take away the carrot, I don't think the game is engaging enough to keep playing. Tap Hero isn't good or bad. It simply is. Such is the state of mobile games. The pixel art is nice to look at, but there isn't much going on. 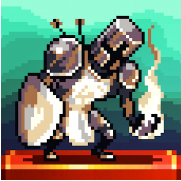 If you like knights, pixelated violence, and not much else, this could be for you.